I grew up in a home that didn't teach me anything bible. This left a deficit in my education as a Christian. Yes, I went to church when I was older but frankly even there we didn't study the science of the bible. Mostly we had good preaching about living right and getting saved. Those are great foundations but I wish I had learned more about history and science. That is why, when we become homeschoolers, my husband and I decided right away we wanted our kids to have a firm foundation in bible. This includes living right but also the deep history of our religion and the beautiful science God created when he made our earth and even us humans. We don't want our kids to lack on the secular point of views. They need to understand how their peers view the world's creation. That is why Debunking Evolution is a great resource. This dvd gives practical information in a enjoyable way. I thought maybe this would be like other dry DVD presentations where some old professor would stand in a classroom setting basically preaching about the topic but that wasn't the case at all. This dvd featured two teens John and Jane with conversational style skits giving out information by presenting full facts from both sides of evolutionist and creationist. They mixed a bit of humor along the way. My older teens and I found this DVD to be informative and fun to watch - which is a high praise coming from today's teens! Join study partners, John & Jane as they explore the challenges to the evolutionary theory and why the Bible makes the most sense of the scientific evidence. Most public schools teach evolution theory as fact, taking a serious toll on the faith of many unprepared Christians. Yet the straight-forward account in Genesis provides the true history of Creation, often making more sense of the evidence. The six-lesson program helps students understand the weak foundations of evolution, teaching them a strong case for the truth of Biblical Creation. 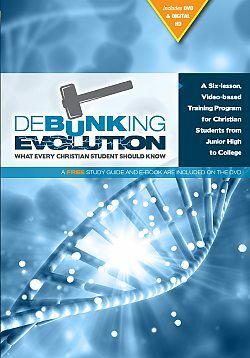 Why is Creation / Evolution Training Important? Bible History—Real of Fiction? Can we trust the Bible’s account of history? Did Humans Evolve from Ape-Like Creatures? I love the way this is presented. It is engaging and perfect for teens. There is an e-book and study guide included with the DVD purchase which makes this a full course of study. For us it is summertime and we are not doing formal school so we just have been watching a bit at night together and discussing. One of the most interesting things is discussing this with my teens. One child expressed dismay and this thought - If people don't believe we go anywhere when we die they why do right, live right, where are the consequences. It was exciting to see him think deeper with the facts presented. He is right too! We answer to God and live for a heavenly rewards but if you don't believe in God you don't have to answer - on earth- to him. Of course we all will face judgement when we die. If your children are in public school or just don't know why we believe in creation - this DVD is a must have! Watch it and discuss it with your teens! You won't be disappointed in this one! Visit AwesomeScienceMedia.com for additional information. I would like to win this DVD and share it with my family!